Parking permits for the next academic year (2017-2018) are available online for employees starting on Thursday, June 1, from Campus Parking Services. The new Automated Issuance Management System (AIMS) provides convenient access to parking account information using your current employee login ID and password. Employees can make a permit purchase, ticket payment and access their account information. Hangtags may be purchased annually or by semester. Blue window decals are available on an annual basis only. An annual motorcycle permit may be purchased at the discounted rate by those with a valid vehicle permit (excluding green permits). A free parking option is available to any interested faculty, staff, student or visitor. Those who take advantage of this option will receive a green permit, which allows for remote parking in Lot C3 on the west side of campus. 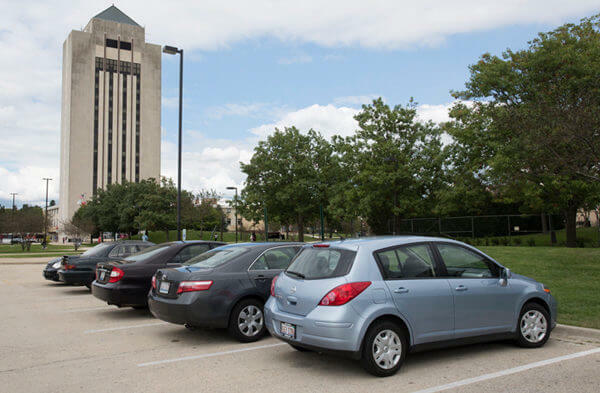 The Board of Trustees authorized a plan through which the purchase of a parking permit can be made as a tax-free benefit through payroll deduction (excluding motorcycle permits). When purchasing a parking permit, four payment options are available: tax-free payroll deduction, check, cash or credit card. Permits can be purchased online or in person from Parking Services starting on Tuesday, June 1 (there is a $10 fee applied for all permits purchased in person, excluding reserved permits), via group method (where a department representative mails or brings in the completed forms for all the individuals, the $10 fee applies here as well), or by mail. When purchasing by mail, print and complete the vehicle registration form. Mail the form and your check (payable to NIU) for the amount of the permit to NIU, Campus Parking Services, 121 Normal Road, DeKalb, IL, 60115. You may also select payroll deduction preference. The parking permit will be mailed to you within three business days of receiving your order. There is an additional $10 fee applied for all permits purchased in person or mail, excluding reserved permits. Please note you are at risk of receiving tickets if a valid parking permit is not displayed in your vehicle. If you have any questions or need more information, please contact Parking Services at 815-753-1045 or parking@niu.edu.